Securing disparate devices, apps and cloud services that access business critical data poses an unrelenting challenge to IT teams. From preventing shadow IT, protecting data at rest and in transit, and more, the challenges are seemingly endless. Fortunately, an advanced mobile security architecture can help take this burden off of IT’s shoulders. 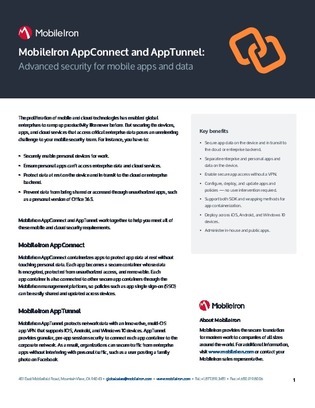 Download this white paper to learn how a mobile security platform with mobile app lifecycle management and a secure multi-OS app VPN can help your organization’s IT team manage mobile data and apps more effectively.